With spring just around the corner, we’re willing to bet that you have a few road trips in the works. In a previous post, we provided you with four easy tips that will help you prepare your RV for spring, so be sure to go back and read through that entry if you haven’t yet seen it. 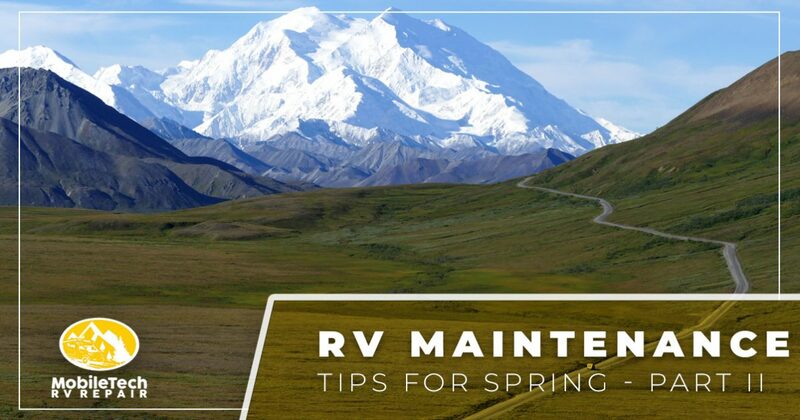 In today’s blog, we’ll continue to expand on that topic and provide you with even more easy ways to get your RV ready for spring. Whether you need routine RV service or extensive RV repairs in Houston, the team from MobileTech RV Repair is always here and ready to help! Get in touch with the MobileTech team here for an appointment, and read on for even more springtime maintenance tips! If your RV has a slide-out, then you should always clean it yourself or have it professionally detailed before you hit the road. Because slide-outs are exposed to the elements, it’s easy for dirt to accumulate in the seals. A bit of dirt is always expected, but prolonged buildup can cause serious issues, including seal damage. If your RV has a cable, hydraulic, Schwintek, or electric slide-out, then bring it to our RV service experts and we’ll ensure that everything is working properly. It’s difficult to overstate the importance of your RV’s electrical system. In addition to powering the appliances that you depend on when you’re on the road, it also powers the heating and cooling system that keeps you and your passengers comfortable. As you perform your springtime RV inspection, be sure to check that all of your lights and appliances are working properly. If a light is flickering, or if something doesn’t seem to be working as it should, then schedule an RV service appointment and our technicians will work quickly to find the source of the problem. Whether the issue is a frayed wire or a damaged connection, we’ll get you back on the road as soon as possible! You’re probably planning to do some spring cleaning around your home, so take the opportunity to do some spring cleaning in your RV, as well! You may have old and outdated drapes hanging from the windows, or your seats might be starting to fray and tear. You’re already planning out your next big trip, so bring your RV to us and let us handle the hard work for you. We can install anything from new couches to top-of-the-line chairs and beds, and we’ll gladly work to help you find upgrades within your price range. You might just decide to extend your next trip when the remodel is complete! Come to MobileTech for RV Service in Houston! We hope that this two-part series will help you prepare your RV for a springtime trip. Watch our blog page in the coming weeks and months, as we’ll be adding even more information about RV repairs and maintenance! Are you ready to schedule an RV maintenance appointment with MobileTech RV Repair? Give us a call or fill out the form below!